So everyone has tickets and etickets in hands and ready to sail or fly away to Thibaud. Join us. We are extremely grateful for your support throughout the past few years of planning for this brilliant event. We definitely could not have done it without you. Please check whether everyone in your family, including babies have an updated passport. This is extremely important as without a valid passport or without one it is extremely difficult to travel. Please triple check your document, especially those who are traveling on special permits to travel. Unfortunately, the weight requirements on the aircrafts have changed and many airlines are allowing only 50lbs for check in luggage and a small carry-on and one personal. For any extra luggage you will be charged $25. We strongly advice you to avoid any inconveniencies, ship some of your toiletries, clothes and children’s food items to Dominica ahead of time. Please make sure to ship all barrels by next week Tuesday (those in the US and Canada) to arrive there on time. You may be cutting it close after the Thanksgiving vacation. Like an architect planning a building, so must you plan the contents of your suitcase by creating a packing list. A packing list eliminates the panic of last-second packing, serves as a handy guide for repacking at the end of the trip, and can be beneficial in the unfortunate event of lost or stolen luggage. When planning your wardrobe, consider the events you will participate in both day and night and write down a possible outfit for each activity. Crosscheck this packing list to determine if one piece can cover multiple occasions. Pick clothes that coordinate well together, based around complimentary colors. Now that the wardrobe is thoroughly planned, stick with it. When packing, lay out the items you intend to take and reexamine your packing list. If possible, weed out single-use items and extras. Set aside the pieces you intend to bring and ensure that they are clean and ready to be packed. Jewelry - don't take what you don't want to lose, and leave behind the flashy pieces that you don’t feel comfortable bringing. Keep makeup to a minimum to save space, and leave the perfume behind when scented lotions will work just as well. When it comes to the question of toiletries, travel kits are always the answer. Having a travel kit perpetually stocked in a waterproof case will save in packing time before the trip and aggravation after arrival. Most personal toiletry items come in inexpensive travel sizes, so purchase these whenever you see them so as not to arrive with a half-empty bottle of your favorite hair gel. And don't fill bottles up to the very top, for pressure inside the plane may force the contents expand and overflow. Please bring sunscreen for the kids. All liquids, gels or aerosols must be in 3 ounce or smaller containers. These containers may now be placed in carry-on baggage, carried through the screening checkpoint and carried on board the aircraft. Items must be placed and fit comfortably in a single (1) zip-top, quart-size (1 liter) clear plastic bag. The bag must be sealed shut and presented to TSA at the screening checkpoint so it can be X-rayed separately. If purchased after the security checkpoint, items including beverages (such as coffee, tea, soft drinks, water), shampoo, suntan lotion, creams, toothpaste, hair gel, hair spray and other aerosols, liquid cosmetics, and other items of similar consistency may be brought on board the aircraft. Liquids (including juice) or gels for diabetic or other medical needs. You may pack solid cosmetics and personal hygiene items in either carry-on or checked baggage. This includes lipstick in a tube, solid deodorant, lip balm and similar solids. Electronic devices, such as cell phones, laptop computers and camera equipment, continue to be allowed in your carry-on luggage. Common lighters are now allowed in carry-on luggage. Torch lighters will continue to be banned in carry-ons. All shoes must be taken off and put into a bin to pass through the X-ray machine. Gel inserts are prohibited, but shoes constructed with gel heels are allowed and must be removed and screened. Travelers are advised to arrive at the airport at least two and a half hours in advance for your flights to Dominica. There are no exceptions, even though you have to sleep at the airport J. Thise overnighting in Puerto Rico, please make your connecting flight on time. You may also want to share hotel rooms. Check the TSA website for more recent updates, call your travel agent or your airline directly if you have any questions. The Reunion Committee in Thibaud is encouraging everyone from the various countries and cities throughout the Diaspora to bring a flag of the country they presently reside in, as well as if you have any Dominican flags please travel with it as well so that we can all show solidarity to our Dominica as well as our country of residence during the official opening ceremony. Those wishing to be vendors at the reunion are required to pay $150 for residents and $200 for non residents per booth for the entire event. We encourage you to be entrepreneurial, and still enjoy the celebration, but please share the responsibility and don’t work too hard. 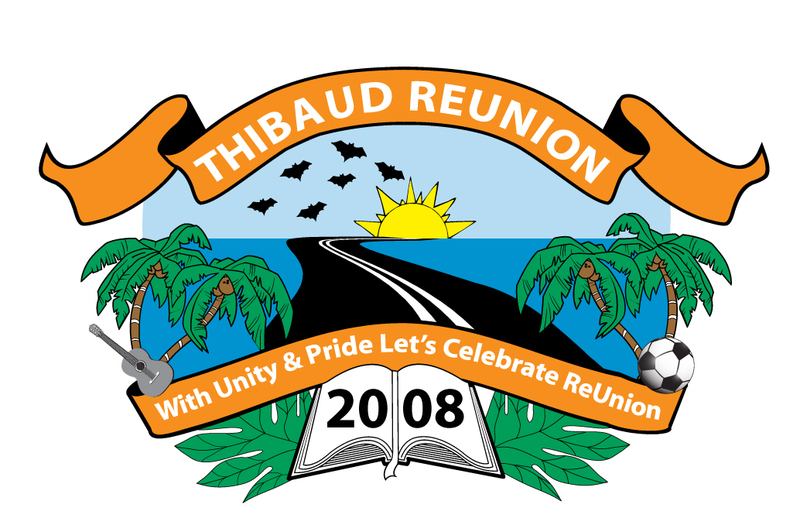 The Florida team has donated the Thibaud reunion printed T-shirts. They will be available for sale in Thibaud for $25. They are orange and come in various sizes. The hospitality committee wants to know how many people will need babysitting services, as they will help make the search for babysitters easier for you, by providing a list of candidates, and you will get to choose who you feel will be best suited to take care of your kids. They are looking at possible candidates from neighbouring villages as well. The hospitality committee also wants you to know that they have arranged car rental and Digicel SIM card and top-up services in Thibaud. So upon your arrival from the airport on your shuttle buses you will be taken to the service facilities in Thibaud and Tere Plat. The welcome services at the ports of entry will only be provided on the 18th and 19th of December, however the shuttle services will be provided until the 20th. To make the shuttle service run more efficiently, we ask you to email us at thibaudreunion2008@yahoo.com to tell us how many in your group will be traveling, and on what day you will arrive in Dominica. Best Deal Car Rental ran by Vaughn Royer, who used to spend occasional time in Thibaud growing up and still does, also runs the Armour Estate in Tere Plat, and has provided some of you with accommodations in Tere Plat has offered us a “Thibaud Reunion Special Package”. There is no need to drive youself from the airport, connect on the shuttle buses. Three door Suzuki Vitara 4WD at US$44.00 per day or US$252.00 weekly. Five door Suzuki Vitara at $55.00 per day and $315.00 weekly. A Honda CRV 4WD, five door at $62.00 daily or $350.00 weekly. Four door car at $40.00 per day or $238.00 weekly. All vehicles are fully loaded with CD stereo and all prices include VAT. For customers with no visa or master cards, they take an EC$3000.00 deposit which is given back to the customer when the vehicle is returned to us with no damage. For those who have credit cards, there will be a $600 fee that will be authorized on your credit card and is not charged. This is very standard in Dominica at the moment. We urge you to contact the rental agencies soon to make your rental arrangements. Please note that as a driver you must be 25 years or more and have at least two years driving experience. Alternatively, an underage surcharge of US$25/day will apply on select vehicles. Also a $12 driving permit will be issued to you by either of the agencies. There are more policies which will be made available to you upon rental of the vehicles. Please be prepared to check the village bulletin boards during your stay in Thibaud, as there will be updates on all the activities that will be taking place during the reunion festivities. In your welcome package you will be handed an itinerary, however if you need to find out more specific information, check the bulletin board. Most of the projects have already been completed or nearing completion; the railings for the bridge in Polinere, the La Souce trails, the beach is sparkling as well as small huts have been erected, the street signs are all up, the Hugh Fabien’s park has a monument in his honour, houses are being painted, a market stand has been built, the local and national government has widened the roads, the library will be completed, the home makeover project has already been completed among many other projects. You will witness all the changes when you visit Thibaud. There is still an opportunity to register for the Tree Lighting competition. Call Mrs. Royer to register at 767.445.5998. Everyone is encouraged to bring extra Christmas lights and extension cords to decorate the village. Please note that tickets are still on sale for the gala. Many of you have been inquiring about the all access silicon wristbands, please note that the wrist band allows you access to all the events including the Miss Reunion show, however, it does not allow you access to the gala. The gala tickets are limited to 300 only at the rate of EC$100. It is advisable that you purchase your tickets in advance from your various team leaders. This could be further arranged through one of the gala coordinators, Mrs. Pearl Douglas at pearlox@aol.com or Mona Francois, Ramona Bontiff from the Gala Committee in Thibaud. The Children’s Christmas party is going to be extra special. We invite you all to bring your children. We can’t wait to see them all in their Christmas attire. Unfortunately, I cannot divulge too much information about the Christmas party as the kids are going to be pleasantly surprise. The South Florida team who is sponsoring the event is catering for over 300 children under the tent on the Hugh Fabien Park, No charge for the party. Words cannot express the gratitude that we feel. We are extremely grateful to all of you who took this ride with us. As the time draws near we want to thank all especially those in Thibaud who have worked extremely hard to make this reunion are reality. Thanks to the committee chair in Thibaud Mrs. Theresa Royer, for all her efforts as well as our village council and our village council chair woman, Mrs. Mary Sambar Bruney, who has also worked hard to make this reunion a reality. The rest of the committee members including Francess, Flores, Ti Paul, Miss Bannis, Mr. Bontiff, Mrs. Canoville, Mr. Lipson, Miss Mary, Mr. Cuthbert, Mr. Peter Paul, Toyo, Jauma Thomas, Mr. Henry, Theresa Honore, Gerard Honore, Miss Ramona, Miss Mona, Rose, and all the others committee members in Thibaud who has helped on the various committees to bring this to reality we thank you. To the Reunion contestants, thank you for signing up to be miss Reunion : Jessica, Kendra, Lisa, Marsha and Nerissa we thank you. Their coach Flores, we know that it has been challenging, thank you. The adorable chairleaders and flag wavers thanks, and your coach Francess, we thank you. The talented Thibaud cultural group we thank you, and your more talented coach Mr. Bernard Bontiff, we thank you. Thanks also to the Dominica Reunion Committee as well as the Government of Dominica, and our Parliamentary representative and Hon. Prime Minister Roosevelt Skerrit, for your efforts. We would also like to thank all the committee leaders and members within the diaspora who have had the challenging role of motivating their troops to meet and fundraise every month. Special Thank You to the small groups like St. Maarten, Toronto, St. Croix, London, and Antigua, who met and raise funds despite the fact that they had very few members. This shows a true sense of loyalty to our community. We would like to thank you, all of you who all helped one way or another to make the reunion a reality. We thank you all. If we have neglected anyone, we are truly, truly sorry. For everyone else, THANK YOU, THANK YOU, THANK YOU!!! !